Her name is Ellie Mae. 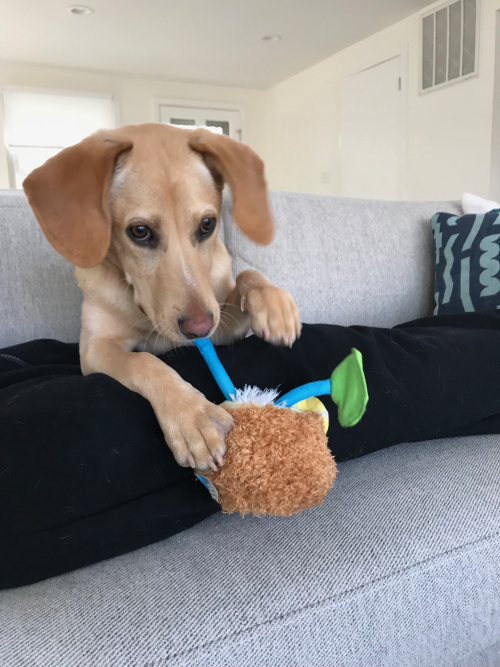 Pictured above, sucking down a squeaky toy version of a Pina Colada, you can't help but fall hard for this pooch. I knew I had it bad when my neighbors across the hall brought her home as a pup and invited me over for cocktails and nibbles to celebrate. Unusual for a canine, the dog wasn't making eyes at the grub on the table. She was staring at my Manhattan with a steady fixation - a fixation that was rewarded by my swirling my pinky into the glass, and holding it out for a greedy lick or two. Oh, yeah. I fell hard. So, clearly I needed to buy Ellie Mae some hard liquor. It came in the form of a chew toy shaped like a bottle of bourbon, emblazoned with a Bark Daniels label. She chewed up that chew toy in short order. So, I decided to introduce her to the finer things in liquor life. I bought her a bottle of Dog Perignon. 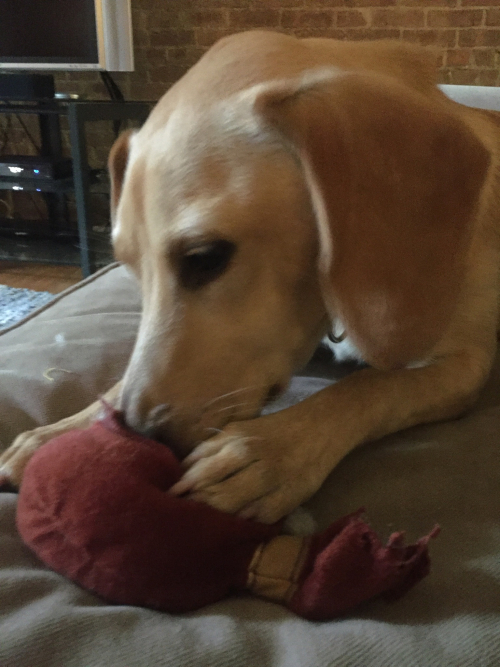 She apparently savored that particular plush toy, as one should with a quality vintage. Yes, that's a plush bottle of Dog Julio that she has her snout in. It didn't make it past an hour. She literally tore the stuffing out of it. Or should I say "good to the last drop?" Not sure what to get her next. If she laid waste to faux tequila that quickly, dare I get her a bottle of Kennel One? Oh, Ellie Mae. Nothing but love and an open bar-k for you here, young gal!